Designed by the Frank Lloyd Wright Foundation and located in beautiful Ventura Harbor – “Gateway To Channel Islands National Park,” the Four Points by Sheraton Ventura Harbor Resort and Holiday Inn Express Hotel & Suites are nestled on 17 acres of California’s Golden Coastline. Experience the difference and wide open wonder that fresh air and an ocean bring to your next successful event. Welcome to harbor life! 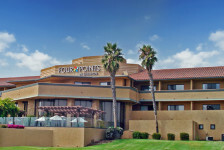 Plan your next Ventura event or meeting at Four Points Ventura Harbor Resort. From the catering menus and snack breaks to the seating configuration and decorations, we’ll help you plan every detail. With our substantial amount of flexible meeting space, we can host groups of up to 400 guests.